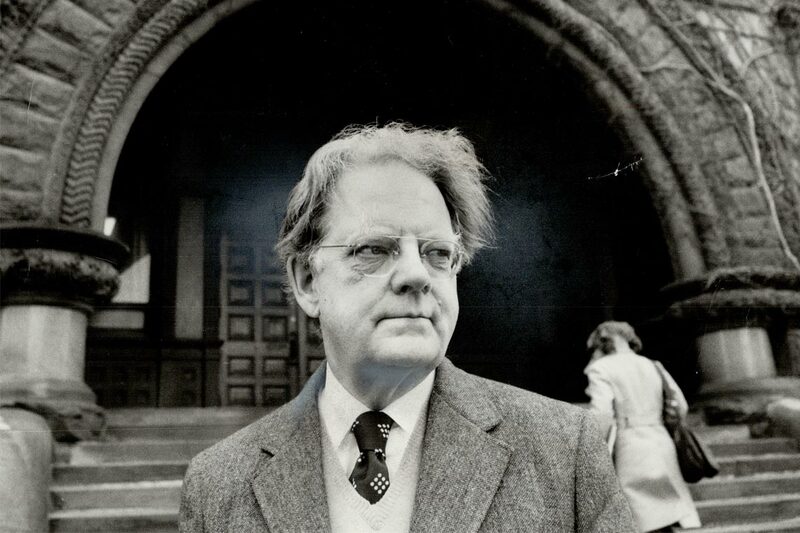 Famed literary theorist and University of Toronto Professor Northrop Frye was commemorated on Thursday by the Canadian government with a Historic Sites and Monuments Board of Canada plaque. The plaque will be installed at Victoria College, near a life-size bronze statue of Frye that was commissioned in 2012 in celebration of what would have been his 100th birthday. Frye first came to U of T as a student in 1929, studying at Victoria College and Emmanuel College before attending Oxford for his master’s degree. He returned to U of T in 1939, teaching in the department of English at Victoria College until his death in 1991. His seminal works Fearful Symmetry: A Study of William Blake and Anatomy of Criticism: Four Essays cemented his place as one of the 20th century’s most important literary critics. “His systematic approach to literature examined the underlying myths and symbols that inform all of literature, challenged existing critical paradigms, and had a significant international influence, as did his work on the Bible as literature,” reads the plaque. The plaque-unveiling ceremony, which acknowledged Frye as a “person of national historic significance,” was attended by members of the U of T community and the Canadian government. They included: Richard Alway, chair of the Historic Sites and Monuments Board of Canada, Carolyn Bennett, a U of T alumna and the federal minister of Crown-Indigenous relations, William Robins, president of Victoria University, and Angela Esterhammer, principal of Victoria College and a professor in the department of English.